UDM Downloads > Macrobject CHM-to-Word Converter! Convert HTML Help to Word, Convert CHM to Doc, CHM Converter, Word Converter, Html Help Convertor. A powerful CHM convertor helping you to create Word document from HTML help. Convert CHM files to perfect Word document without any HTML or CHM skills. Make Word document from CHM file in seconds with a single click. Keep the format/style/layout (include images and tables) of the original CHM file. Embed all images into Word document and no external files are required. CHM-2-Word include many unique features: 1) Keep the format, styles and layout. 2) Keep the images in the generated Word document. 3) Command line and project supports, and much more. 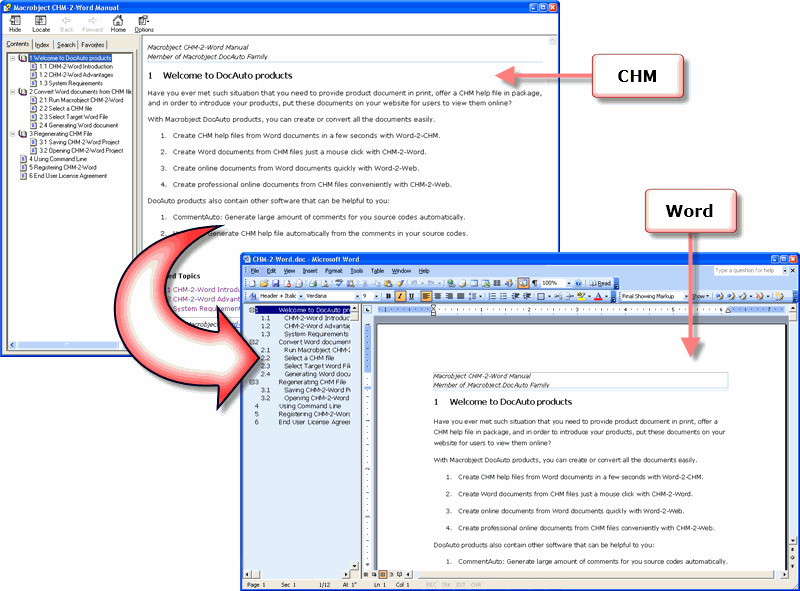 Related Products Word-2-CHM: http://www.macrobject.com/en/word-2-chm/index.htm Convert Word document to perfect HTML help or CHM e-book. Word-2-Web: http://www.macrobject.com/en/word-2-web/index.htm Convert Word document to perfect Web online-document.